HomeBusiness West BlogWhy is it so difficult to make growth 'green'? Why is it so difficult to make growth 'green'? There are some fine words in the Government’s Clean Growth Strategy, Industrial Strategy, and 25 Year Plan for the Environment. But why does it seem difficult to make growth ‘green’? It’s worth reflecting on what is commonly understood as ‘growth’. The US economist Simon Kuznets developed the concept of Gross Domestic Product (GDP) in the late 1930s as a single metric which would rise in ‘good’, and fall in ‘bad’ times: it has since become the primary measure of national economic performance. GDP adds together consumption, investment, government purchases and exports, and deducts imports. This is why government’s ongoing desire is to see us sell more overseas, and import less, so that GDP goes up. However, suppose I live in a country where industrial production – and the associated exports – are linked to high levels of pollution: shouldn’t the resulting impact on people’s heath be registered negatively? In reality a well-functioning health service or health insurance scheme might boom as a result of pollution. Net exports increase because industry’s costs are kept low (no requirement to reduce pollution), and either government purchases (health service) go up, or consumption rises owing to increasing demand for health insurance. Similarly, consuming ever larger numbers of disposable plastic bottles also has a positive impact on GDP: it only leads to a reduction if there is a decline in tourism or fishing as a result of the host of problems plastic pollution causes in the oceans. If, on the other hand, you stroll out of your office and into a nature-rich green space, studies suggest that your heart rate might fall and your stress levels will decline. If there is less spending on the health service as a result, government expenditure – and GDP – falls. In short, your wellbeing increases, but GDP declines. It’s clear that GDP isn’t measuring the quality of our lives, or the environment. There is a movement to change this: Bhutan set out to increase ‘gross national happiness’ in 1972; the UN’s Human Development Index was developed in 1990; and here in the West of England, Happy City has sought to shift the focus away from GDP and to the measurement of wellbeing. The graphic below illustrates the point rather well. 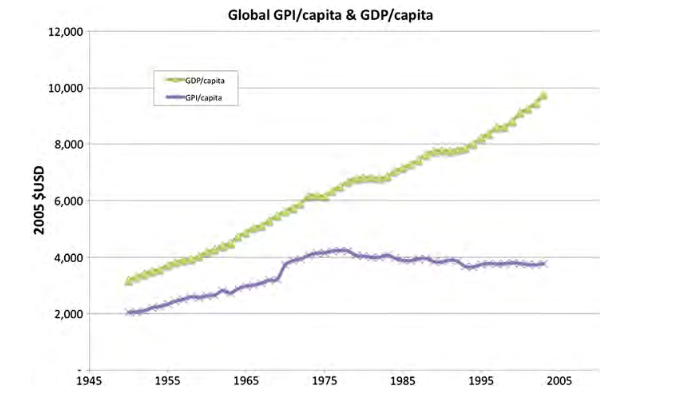 It shows a plot of global GDP per capita alongside the Genuine Progress Indicator, which seeks to measure welfare. The graphic shows that above a level of GDP per capita of around $7,000, as GDP has risen, GPI has actually declined: we’re growing, but our growth diminishes welfare by this measure. Combined Authorities have been tasked by Government with increasing Gross Value Added (GVA) - the regional equivalent of GDP - and employment. However, this aim offers no guarantee that we, or the environment, will be healthier as a result. It is interesting to see how other city regions have broached this issue: in Greater Manchester work, for example, is centred on a low-carbon hub, which as well as addressing issues of greenhouse gas emissions through potentially ambitious new targets, also looks to address air quality, natural capital, and waste and resources – and includes free advice for small and medium-sized enterprises (SMEs). This in itself offers no guarantee that ‘growth’ will be green in Manchester: but if we in the West of England are to develop in a way that improves the lives of our citizens, then we cannot rely on the unadjusted measure of GVA. Indeed, if we do that, then growth may well come at the expense of wellbeing. As someone born and bred in Bristol, it’s incredibly disappointing that this region seems to I am concerned that this region is at danger of simply be pursuing ‘GVA’, the regional equivalent of GDP, as though it is colour-blind. I want to see our region demonstrate leadership and develop in ways that enhance, rather than impair, the lives of residents. In order to do that, we need to consider different measures of economic performance, including adjusting GVA to reflect the impact of economic activity. This should account for the way in which air quality impairs the health of citizens, and the changes in the health of our natural capital stock, which contributes services to us all ‘for free’. We should understand better the flows of materials through the regional economy to inform how they might be better used, and seek to understand – and the address - the distributional consequences of unequal access to green space, or the effects on different ethnic groups of poor air quality, or of noise. If we, in the West of England – our businesses and our people – are to fashion a future for the region where people are happy, and in good health, and where the environment thrives, then without some major restructuring of incentives in the economy, the metric of GVA will remain a thoroughly misleading indicator. We need to take actions to address the potentially dire consequences of climate change, the poor quality of the air we breathe, and the silent loss of biodiversity, and improve the mental and physical health of our residents. Growth for growth’s sake, as it was once said, is the ideology of the cancer cell. And if the Government is sincere in its view that green growth is the great opportunity of the 21st century, then we need to get serious about seizing it by demonstrating what green growth means right here in Bristol and the West of England. It’s very unlikely to be something that we achieve through the blind pursuit of GVA.